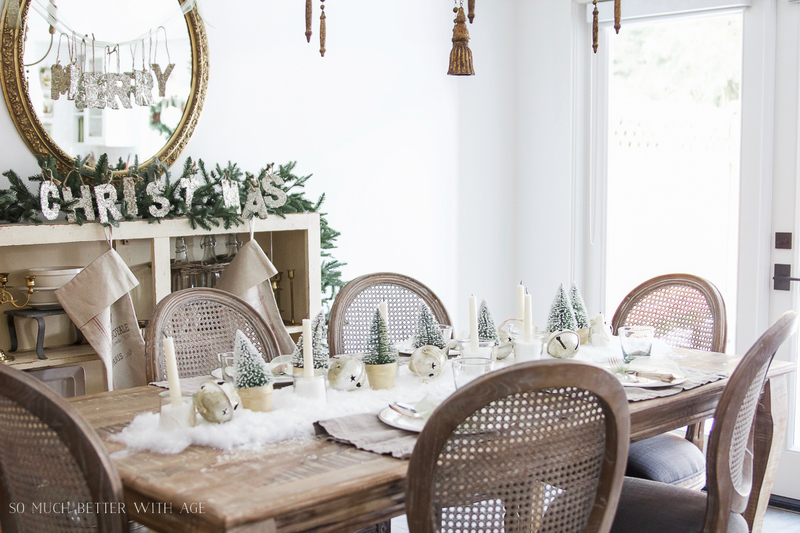 My Christmas dining room with DIY snowy centrepiece is so pretty! I can’t wait to show you. 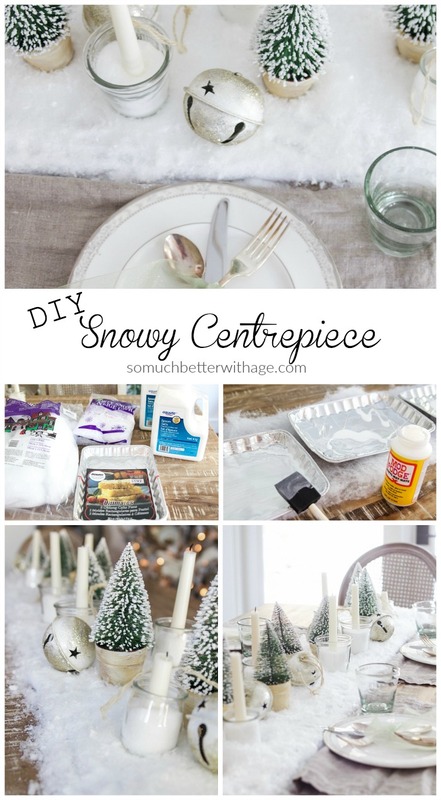 I’m also showing you how to make a DIY snowy centrepiece that looks like real snow but will protect your dining room table from most of the mess. I’ve had this idea for a snowy centrepiece for months but it’s even extra special today because it snowed alllll day yesterday and my kids even had a snow day! It rarely snows here in Vancouver, maybe once or twice a season but it’s really early to snow beginning of December. It just worked out perfect the snow outside and the ‘snow’ on my table. 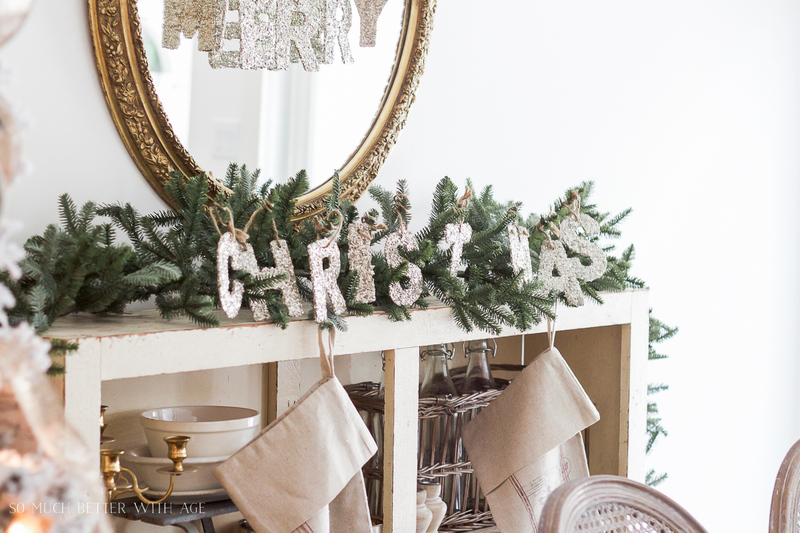 Thank you, Christine from The DIY Mommy for inviting me to this Canadian Bloggers Home Tour that is happening all week and with nearly 30 amazing bloggers. There’s so much to see so let’s get started! 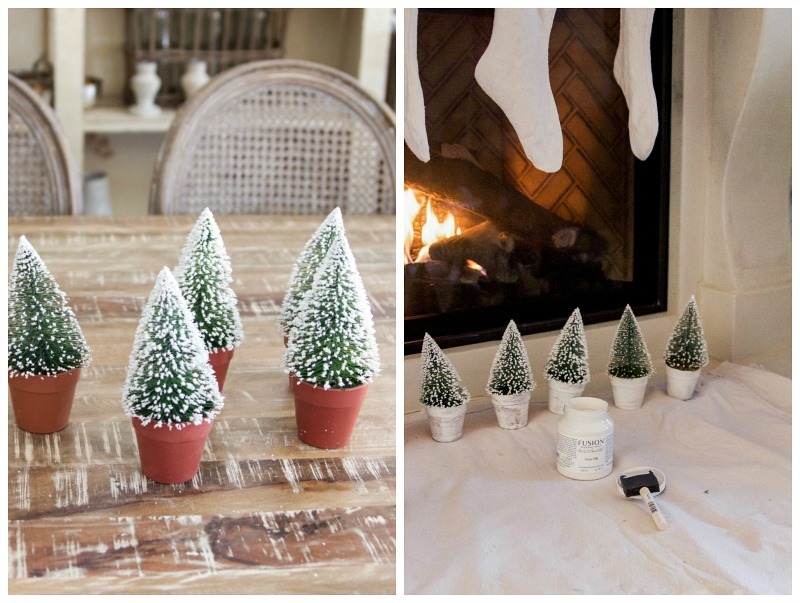 The first part of the snowy centrepiece is to paint these dollar store bottlebrush trees. I started with a light coat of Raw Silk from Fusion Mineral Paint then gave them a round of speed drying in the front of the fire. Then I applied a light second coat of Gold Metallic from Fusion Mineral Paint. Start with gathering your supplies. Lay down some of the snowy village buffalo snow (like batting but very soft). Lay on your table like a runner. 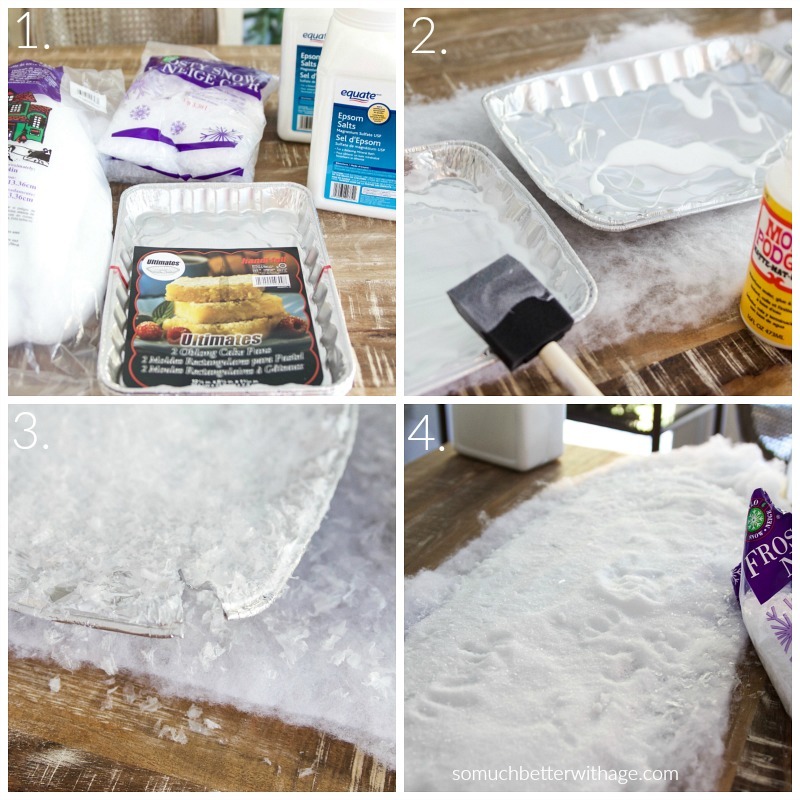 Glue or use Mod Podge and coat entire baking trays especially the edges. Cut the four corners of each tray to lay flat (best to do before glue unlike me). Sprinkle the frosty snow all over. Add the epsom salts all over the trays. I bought two but I only needed one, which is shocking as I thought I would need more. Finish off the top with another bag of the frosty snow. 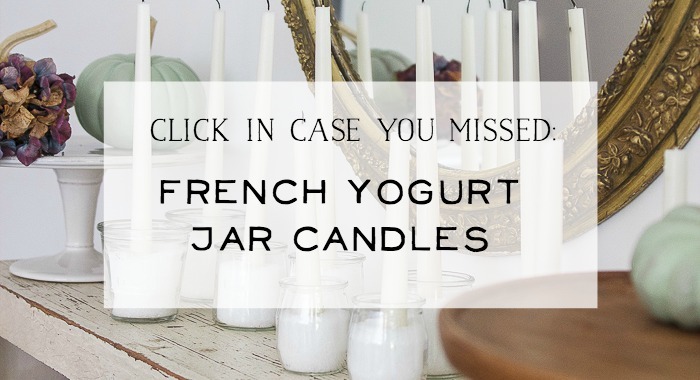 Stick in your bottlebrush trees, jingle bells, candles (I used my French yogurt jar candles) and you have a snowy centrepiece. 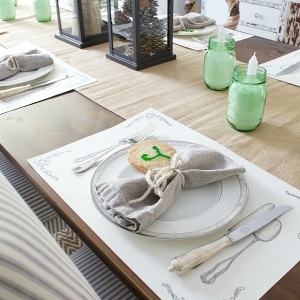 And most importantly, your table is protected and will be easier to dismantle later on. 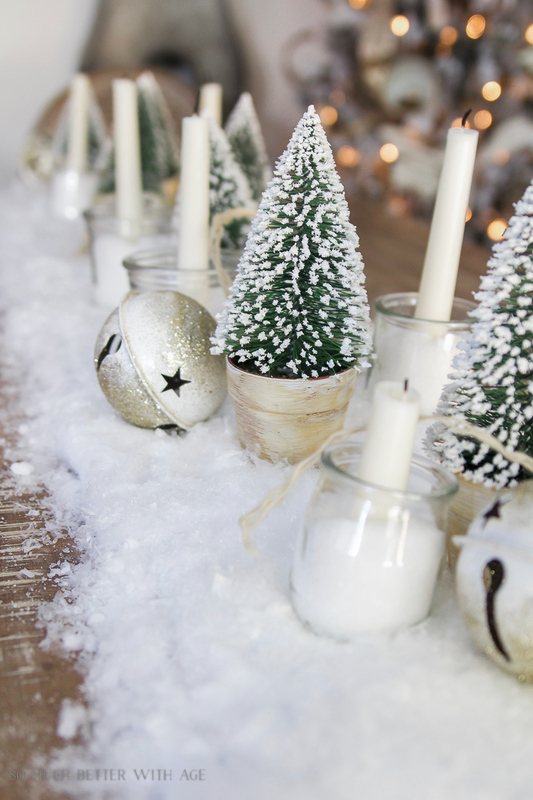 There is so much ‘snow’ that I love the way the candles sink into it to give it a real effect. I love my china pattern but it is not made anymore, Royal Doulton Naples Platinum. Here are some similar patterns I found. The glittery gold ‘Merry Christmas’ banner were letters I found at Michael’s same as the Noel letters I used. 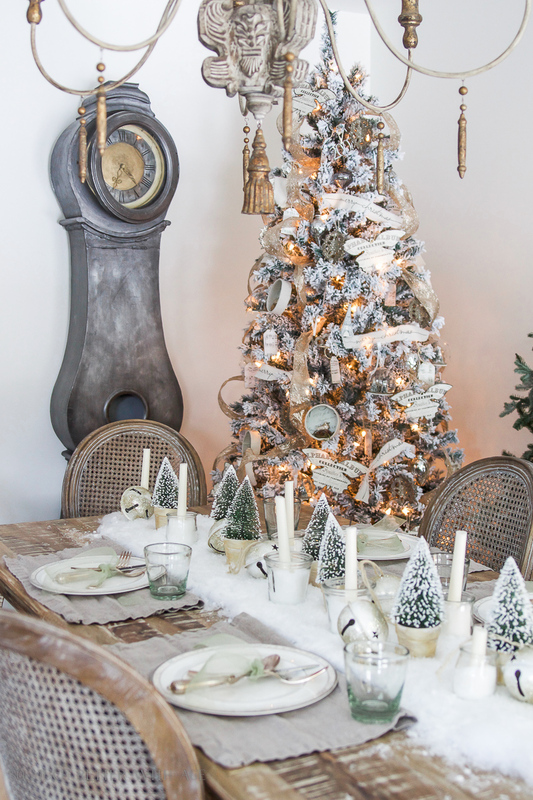 I also recently gave a review on the two flocked trees I bought this year. I’m so in love with both of them. I get a lot of questions about my dining room chairs. I bought them at a local furniture shop but I’ve sourced a few places to buy similar ones online. Be sure to visit all the other fabulous tours this week. 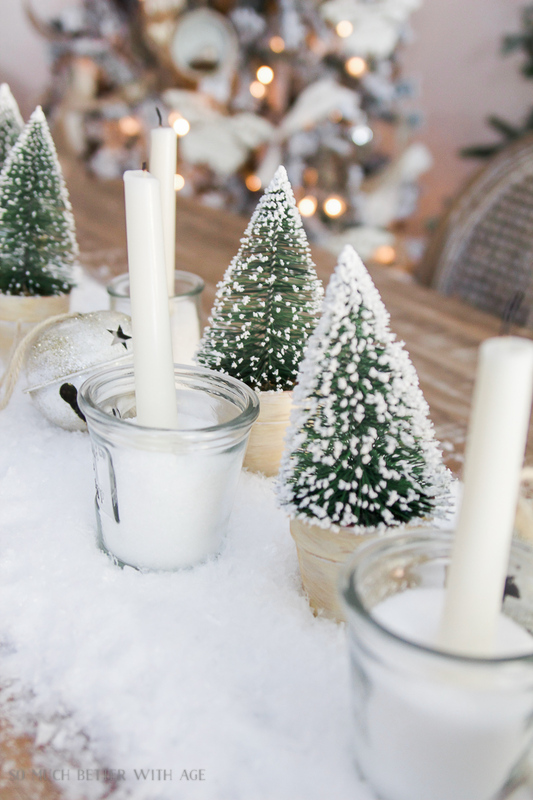 So very pretty a perfect snowy scene, I love the idea of using Epson salts to hold candles, so smart! Gorgeous centrepiece and table setting!!!! Stunning! 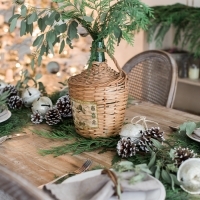 my jaw literally hit the floor when I scrolled to your centerpiece – so stunning! I love how simple, but totally elegant it is. Aww, thanks so much Heather! hey girl love the centerpiece! Jamie, I love this space. 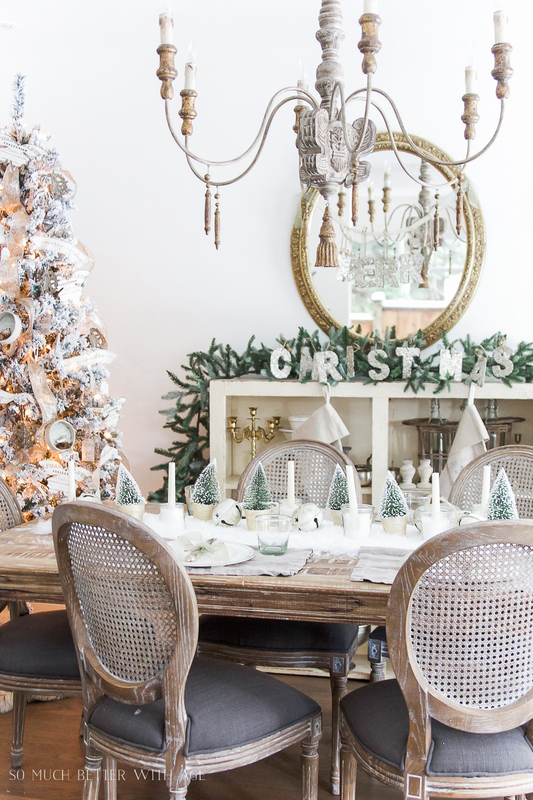 You have such a knack for styling, and your Christmas decor is a testament to that. That tree! I love it! You’re too kind, Tara! Thanks so much. I’m completely obsessed with your dining room table and chairs. And that chandelier! Seriously, so gorgeous!! Aww, thanks Thalita! Love your tour too! Happy holidays! 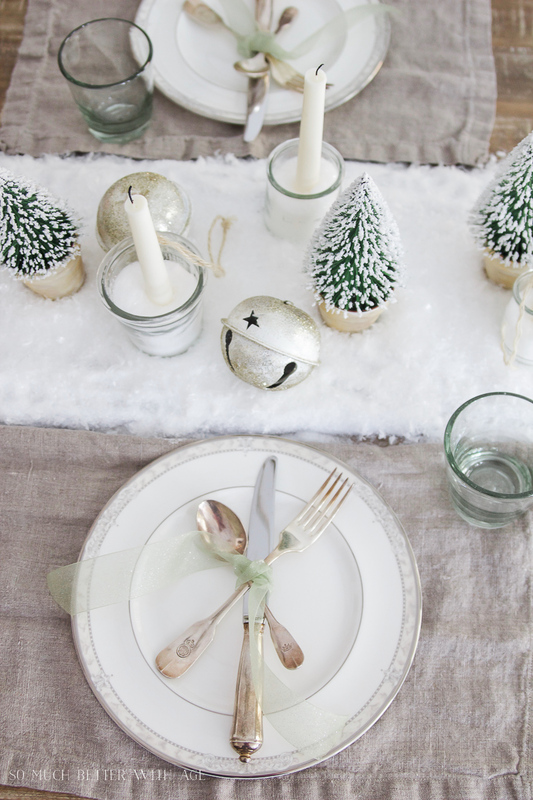 That idea of metal trays for the centrepiece is genius! I always wondered who would dump a bag of salt on their table. The clean-up would be insane! Not only is the stunning, but it’s smart design. Well done! p.s can we talk about that tree?! Right??!? haha Thanks Ariel! I saw you at Haven but never got a chance to say hi to you. Let me know if you’re going this year. This is a perfectly snowy scene! I love the winter wonderland feel! Merry Christmas! Oh wow, Jamie! This whole room is simply stunning. You do French country so perfectly. 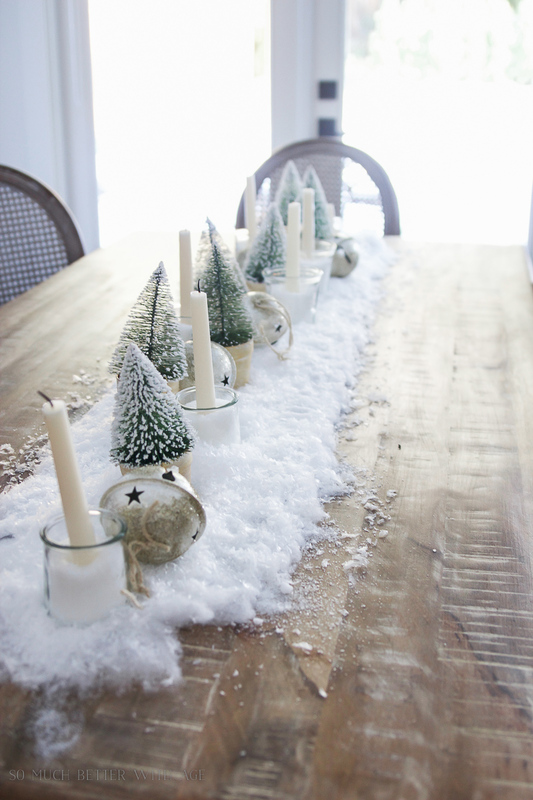 And what a great idea to do the DIY snowy runner! Thanks so much for sharing all of the inspiration! Aww thanks Christina! Thanks for inviting me. Happy holidays! I wanted to pin every single picture. Thank you Shannon! Happy holidays! Gorgeous! 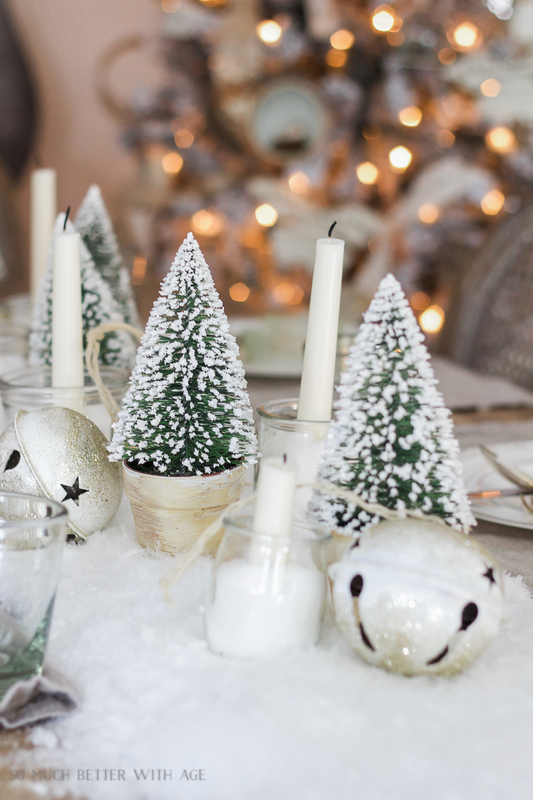 That centerpiece looks like a beautiful snowy forest I want to live in. Lovely! Me too! Thanks Becki! Happy holidays! Okay, so my jaw may have dropped just a little when I saw your dining room. So, so very pretty! Can you come decorate my house? Wishing you a very merry Christmas!! Awww, thanks Shauna!! Happy holidays! 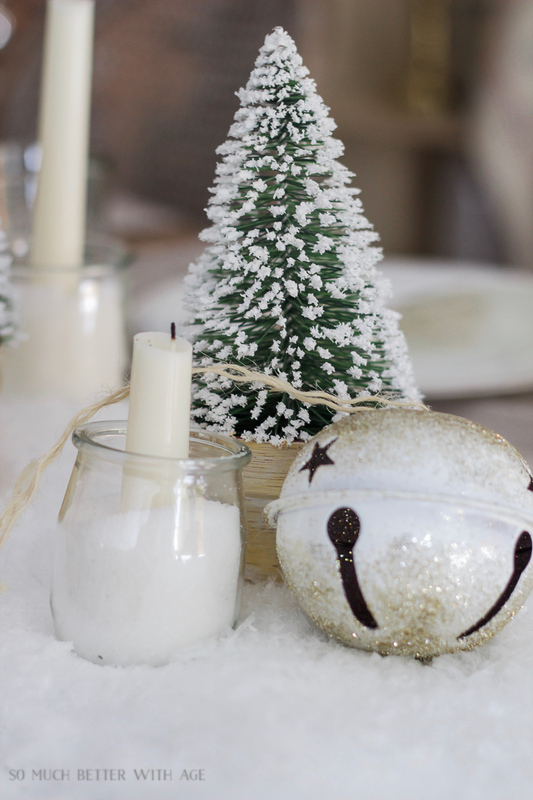 Oh my goodness this snowy centrepiece is out of this world. Amazing! Jamie – I love it – gorgeous and brilliant!! Thanks so much, Krista! Happy holidays! This is gorgeous! Thanks for posting the tutorial. I’m gonna make some snow! YAA! So glad I’ve inspired you. Happy holidays! 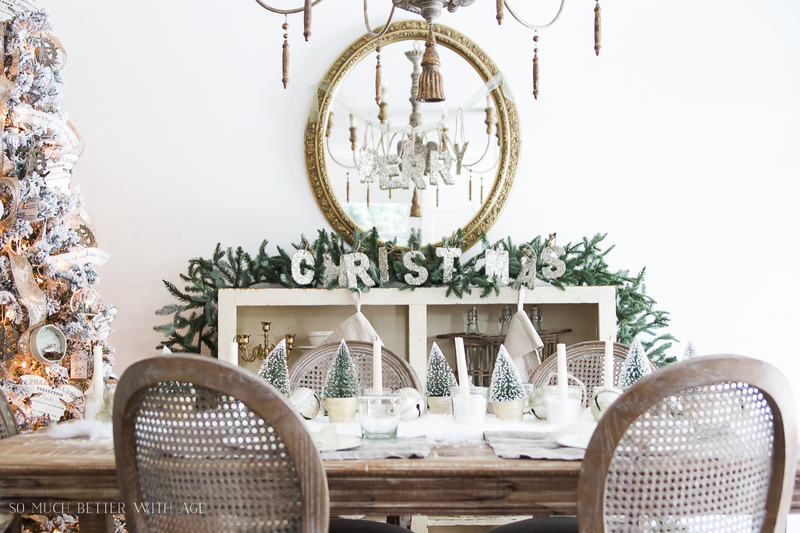 So love your style and taste for Christmas decor! 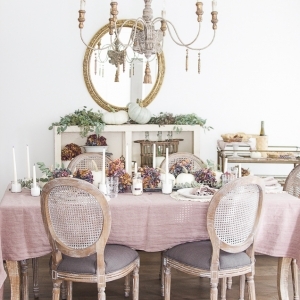 The tablescape is so delightful! Just curious why several of the links have a strike/through line through them? Thank you so much, Thea!! If the link isn’t working in WordPress, it puts a strike through the URL so you know it needs fixing. Although lately sometimes even when the link is fine, there’s a strike through. So annoying lol. Happy holidays! Your table is beautiful. Love the snowy Christmas look, and your tutorial is awesome. Let it snow, looks so great. Thank you so much, Danielle! Hope you have a wonderful holiday this year. 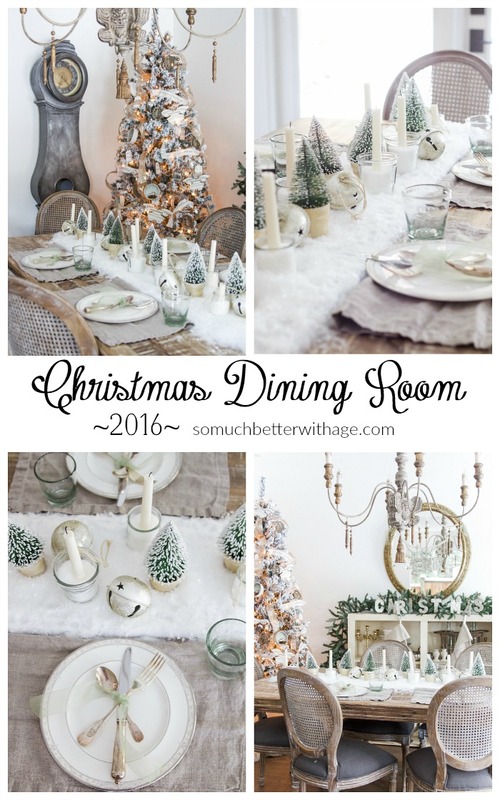 Love your dining room and the tablescape is gorgeous… Happy Christmas! Thank you so much, Kim! Happy holidays to you and your family. 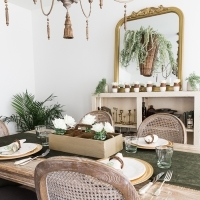 Your dining room looks absolutely gorgeous! 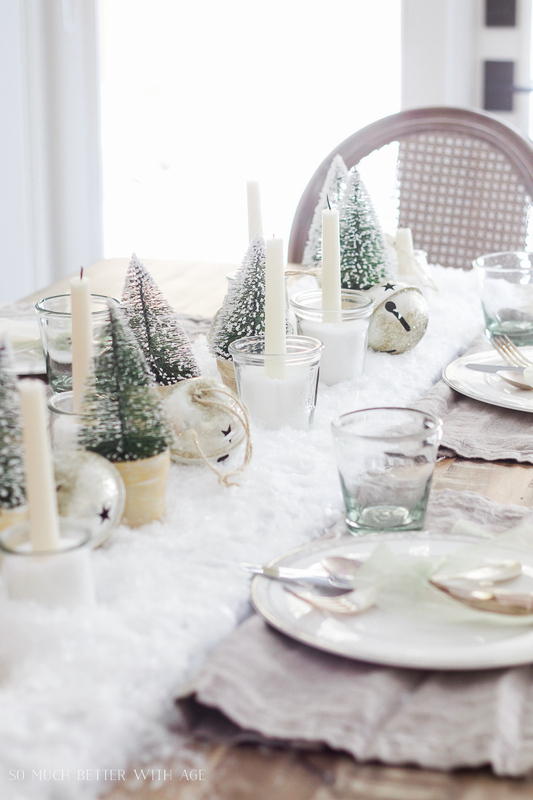 And I really want to make that snowy centrepiece. It’s a fabulous idea! Thanks so much, Joann. Merry Christmas! Thank you so much, Laura. Merry Christmas. Your blog is beautiful, merry christmas. So pretty! I love all the white. 🙂 Stopping by from the Scoop link up. This is so pretty and easy to do. This would look amazing in my home as its all decorated in white. Thank you for the inspiration. Very beautiful snowy decor. You have a lot of talent for it. That tree was wonderful! I loved!